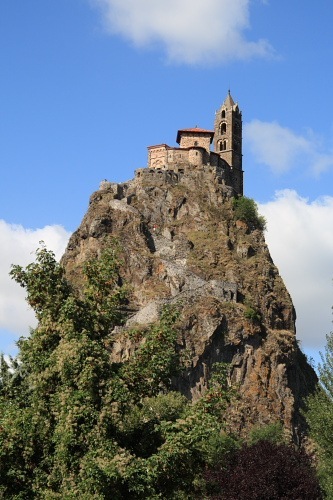 Le Puy, to give it its familiar shortened name, lies smack bang in the middle of the Massif Central. a huge formerly volcanic mass of uplands in the middle of France. All three roads leading to Le Puy cross passes topping 1000m/3000ft. We bought new sleeping bags before embarking upon this trip. They are considerably thinner than our old sleeping bags. Today we awoke to utterly cloudless skies with a noticeable chill in the air. The noticeable chill was inside Billy, too. Am I going to need to leave overnight heating on to compensate for thinner sleeping bags in the mountain regions? I didn’t realize before we got here but Le Puy is famous for several reasons. First, the town is surrounded by volcanic pinnacles of rock. Rather more spectacular, in my view, are the pinnacles of volcanic rock within the town itself. One of these, the Rocher Corneille, stands 755m (~2300ft) above sea level and is capped by a massive statue of The Virgin (yeah, right!) and Child The statue was cast from 213 guns captured at Sebastopol (it says here) and painted red. 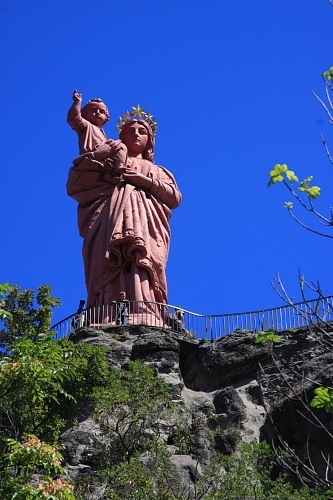 Why anyone would cast 213 canons into a Virgin and Child statue so large that it dwarfs the town, then paint it red, is completely beyond me. Another needle-pointed pinnacle is capped by the impressive but ludicrously situated church of St-Michel. Completely bizarre! Secondly, the town was once a centre of lace making. 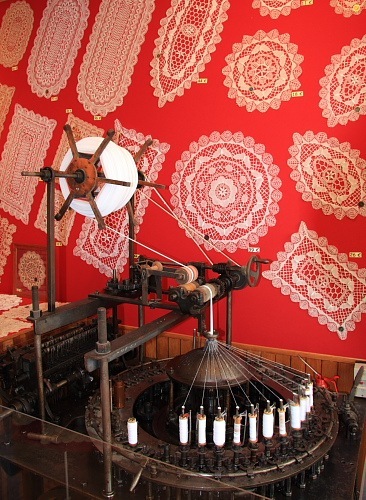 The lace making still goes on but it’s clearly now done purely as a tourist attraction. I know it’s very clever but quite why a grown man would sit with a cushion on his lap painstakingly twisting very fine thread mounted on dozens of bobbins into intricate, fine designs for hours on end is completely beyond me. We did, however, see a very clever machine dating from 1920 that automates the arduous task and in a most elegant way, bobbins dancing magically before one’s eyes. Thirdly, Le Puy is the start of a pilgrimage route to Santiago de Compostela, a 1600kms/1000ml trek into and across Spain. Once again, quite why an otherwise sane individual would decide to embark upon a 1600kms trek from Le Puy-en-Velay to Santiago de Compostela is completely beyond me. “I’m just popping out for a walk, dear, I may see you next year if I’m still alive.” Somebody must have thought it was a good idea. Apparently Le Puy’s Bishop Godescalk did in the 10th century. Finally, Le Puy is famous for its appelation controllée green lentils. Ah, now this I do understand. They are delicious and we eat them quite regularly. I imagine that the volcanic soil sets the lentils of Le Puy apart from others but that’s just a guess. I haven’t yet found a lentil museum. I’d love to see how they grow, though.